Adkins SW, Ashmore SE, Navie SC (eds). CAB International, Wallingford, UK. Figure 1. Qualitative model for the generation of apoplastic hydroxyl radicals. NADH oxidases located in the plasma membrane catalyze the formation of apoplastic superoxide anions. 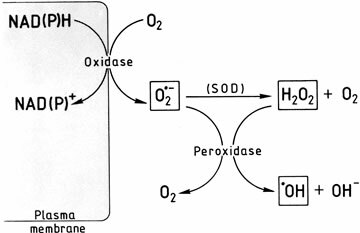 Superoxide is dismutated to hydrogen peroxide and molecular oxygen by superoxide dismutase (SOD). A Fenton-type reaction can take place in the presence of peroxidases, leading to the formation of hydroxyl radicals. From Schopfer et al. (2001) Plant Physiology 125: 1591-1602, with permission, © ASPB. Figure 3. Lepidium seed germination is a two step process: Testa rupture precedes endosperm rupture. ABA delays endosperm rupture, but not testa rupture. We propose that reactive oxygen species produced in the cell wall play a role in endosperm weakening which takes place before endosperm rupture. See also Müller et al. (2006). Based on the oral presentation of Kerstin Müller in Brisbane, May 2005. Awarded as one of the best student presentations.